BCS XI arrived to the inaugural match at the new Home field for the Fall surprised to see the infield diamonds of dirt in 2 corners of the field. Though, reservations were assuaged once the game began and the baseball dirt had little affect on the run of play. The game began fairly even, though once XI settled in the pressure was really on the visitors. TST began to give up more space and midway through the first half Stu found himself in on goal from a slick through ball from Jan and put the home side up 1-0. No more than 10 minutes later it was deja vu from Stu on the through ball slotted past the keeper for his brace and it's 2-0 with the home side cruising. The second half started much like the previous half finished with BCS applying pressure on the visitors. Though TST managed to pick things up and start pushing back for their best spell of attack. There was a solid 10 minutes of BCS on the back foot though Top Star was unable to convert any of their chances despite testing Dave in goal a few times. The next goal game from new boy Chika showing a bit of individual skill takes on a defender 1v1 then with composure calmly places the ball under the keeper for his 2nd goal in 3 games and putting XI up 3-0. Speaking of individual skill the next goal was an audacious finish from Jan as he squarely connects with the ball to send it in the back of the net from his brilliant bicycle kick! Who would have thought you'd see such a goal in division 4 of the Bay State Soccer League? Not to be outdone Stu, looking for his hat-trick, makes his next attempt on goal a bicycle of his own, though doesn't get enough on it to score like Jan did. The visitors were looking tired and downtrodden at this point and were giving up fouls from late, clumsy challenges. Joe finally made up for missing a goal mouth sitter by beating the keeper on the far post for his 9th of the season in all competitions. and putting the home side up 5-0. Despite the score line the visitors didn't give up and were rewarded with a soft goal from a ball that floated in after Dave parried away the initial shot back to the TST striker, who managed to loft one into the 6 yard box that ended up in the side netting. In the end BCS XI would have been happier to keep the clean sheet, though the 5 goals make that an easier pill to swallow; especially since it could have easily been a few more. As the last of the players left the pitch, a raven alighted on the field from the trees above. 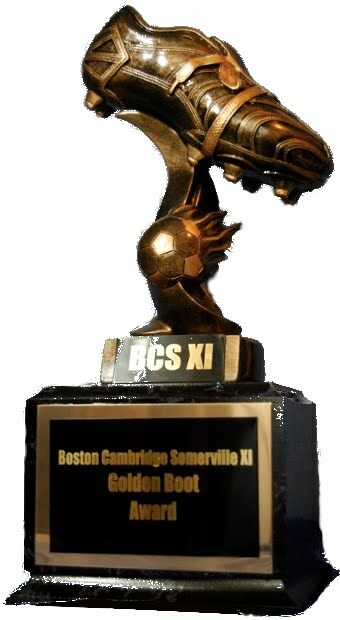 The bird from the BCS XI crest could be taken as a good omen for the rest of the season, especially on home grass at Conway Park.